Krabi is easily summed up in one word – relaxation. Krabi is known the world over as being one of the most tranquil provinces in Thailand, offering the ultimate location to escape into a tropical paradise. 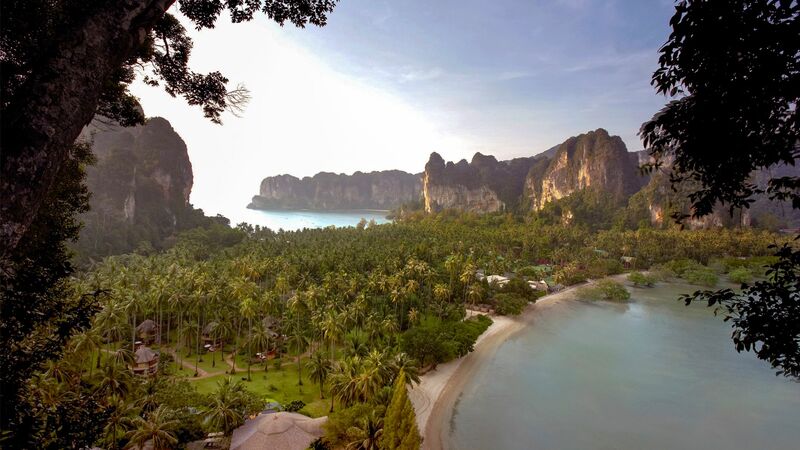 Krabi is located on the beautiful west coast of southern Thailand and is famed for its awe inspiring views. Set against a backdrop of limestone cliffs and lush rainforests, holidaymakers can discover a breath taking coastline where turquoise waves gently lap against the pristine sands. Although the area is famed for its peaceful vibe, there are lots of opportunities for exploration. Dozens of islands frame the horizon (including Koh Hong and the Phi Phi islands) and provide excursions, where you can discover secret coves and some of the country’s best snorkelling spots. Rock climbers are also drawn to Krabi’s coastline as a result of its gigantic cliffs which are home to numerous untouched caves – perfect for those with an adventurous streak. Not to mention the mineral rich Emerald Pool, surrounded by natural hot spring waterfalls. If you’re looking for urban exploration, Krabi Town has an authentic vibe, full of street food stalls and small boutiques selling a range of Thai wares. Holidays in Krabi offer the perfect combination of adventure and tranquillity. Outstanding five star resorts and hotels are dotted along the rugged limestone coastline. 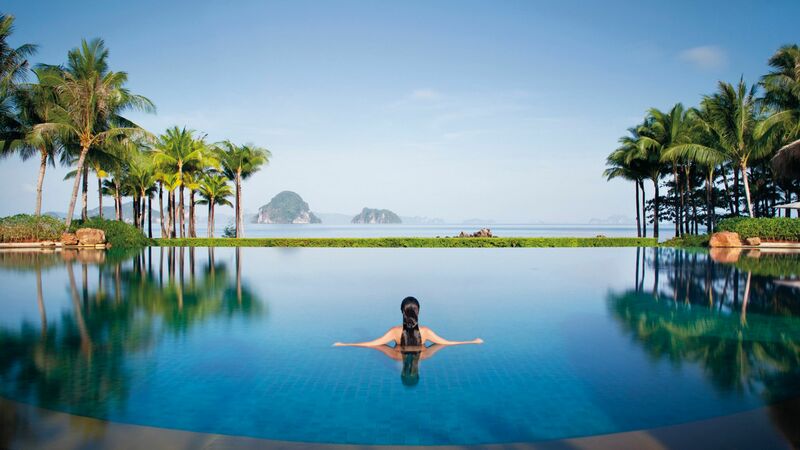 Perfectly positioned between the dramatic seascape and lush jungle is Phulay Bay, A Ritz-Carlton Reserve. This resort is an exotic beach sanctuary, where a stunning infinity pool and luxury spa are surrounded by opulent villas and pavilions. The onsite restaurants are renowned for being some of the best in Krabi, ideal for those who wish to enjoy outstanding cuisine. For a traditional Thai experience, the Rayavadee resort offers a spectacular holiday immersed in Krabi’s outstanding natural scenery. Located on the edge of Krabi Marine National Park, this resort is a paradise for wildlife. It’s no surprise that it’s a member of ‘The Leading Hotels in the World’, and the combination of clear blue sea, lush tropical gardens and dense jungle creates memories which last a lifetime. Sovereign’s team of holiday experts are dedicated to creating getaways with a difference. With a passion for luxury, we pride ourselves in offering only the best hotels across the globe. We’re masters in crafting extraordinary holiday experiences which are unique to our customers. Krabi’s Emerald Pool is a beautiful pond filled with mineral-rich spring water and hot spring waterfalls, where you can enjoy the luxury of wallowing in balmy natural pools and cascades. The water is some of the clearest in the area, and its backdrop is pretty impressive too – it’s set in the rainforest and is surrounded by towering trees. The waters off Krabi are studded with dozens of islands. The four that make up Koh Hong are a popular daytrip, as are the two Phi Phi islands, Phi Phi Don and Phi Phi Leh. These islands were the beautiful setting for Leonardo DiCaprio’s film The Beach. Take a boat out for the day and you’ll find pristine beaches, half-hidden coves and some of Thailand’s best snorkelling. The sea life in this part of the world is second to none – everything from turtles to leopard sharks calls the Andaman Sea home. Krabi boasts more than 32 dive sites, offering a mixture of experiences for all levels. There are also plenty of snorkelling opportunities just a short swim from the sand. Transfer time from Krabi airport to Krabi by car and boat is approximately 55 minutes.